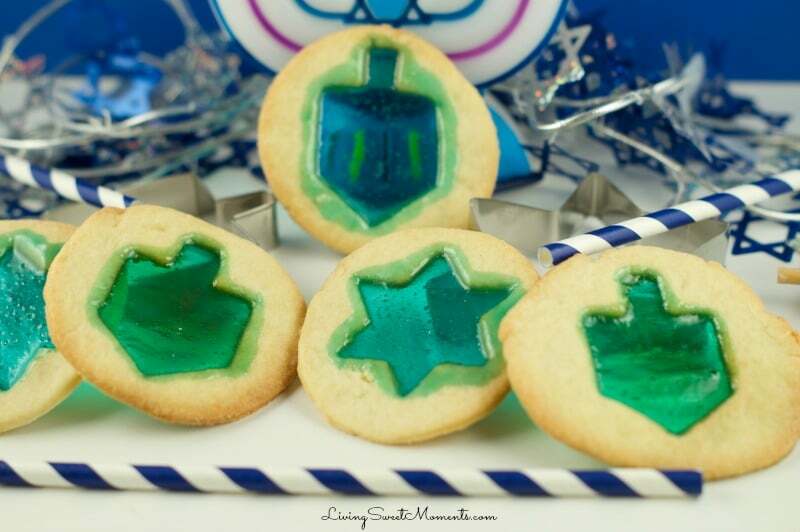 Delicious Hanukkah stained glass cookies. 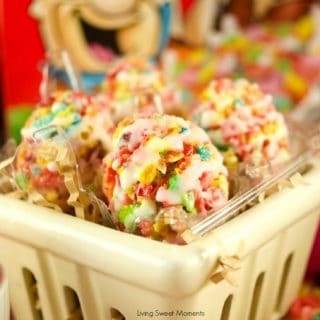 So easy to make and fun with kids! Create this delicious effect in few easy steps. 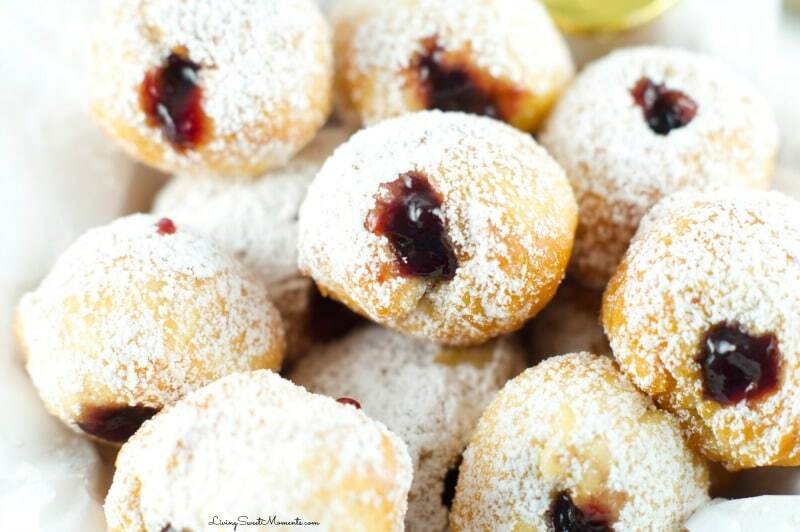 Sweet, crumbly and oh so yummy. 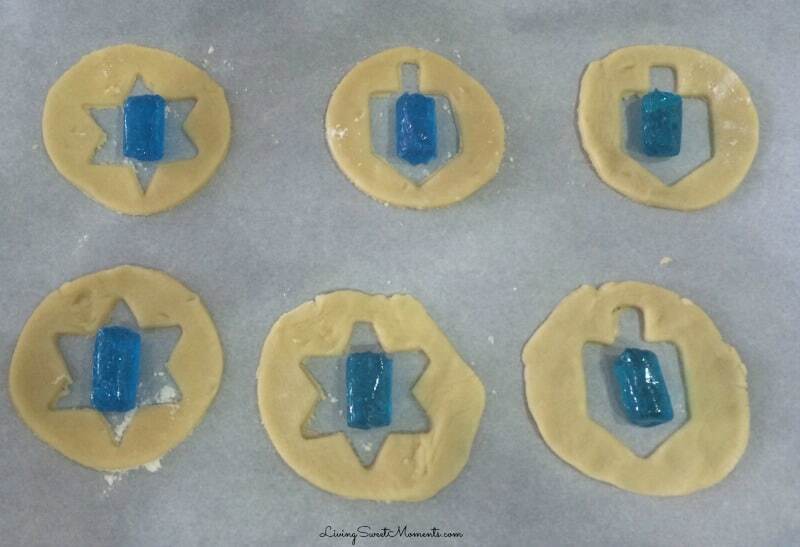 As you can see, I’ve been busy making Hanukkah cookies this weekend. My daughters can’t complain! 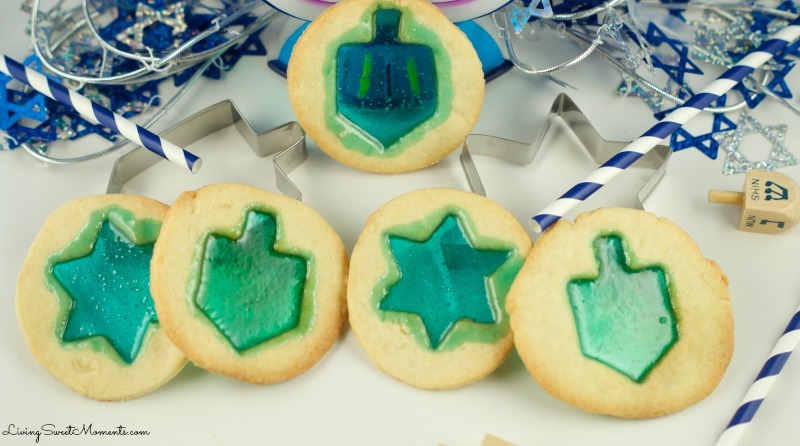 They’ve been helping me roll, cut out, and bake some yummy treats like these beautiful Hanukkah Stained Glass Cookies. I love how these cookies let the light shine through. It has a “wow” factor with kids and adults. 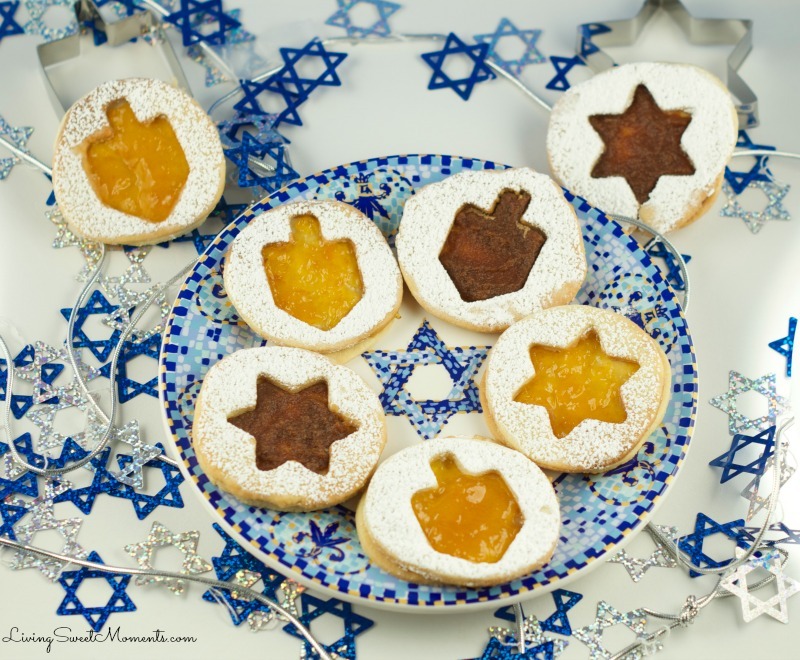 Serve them as dessert for the 8 nights of Hanukkah and it will be a hit. If you really want to get creative, mix and max stained glass colors to create beautiful combinations. I chose just one to go with my theme. 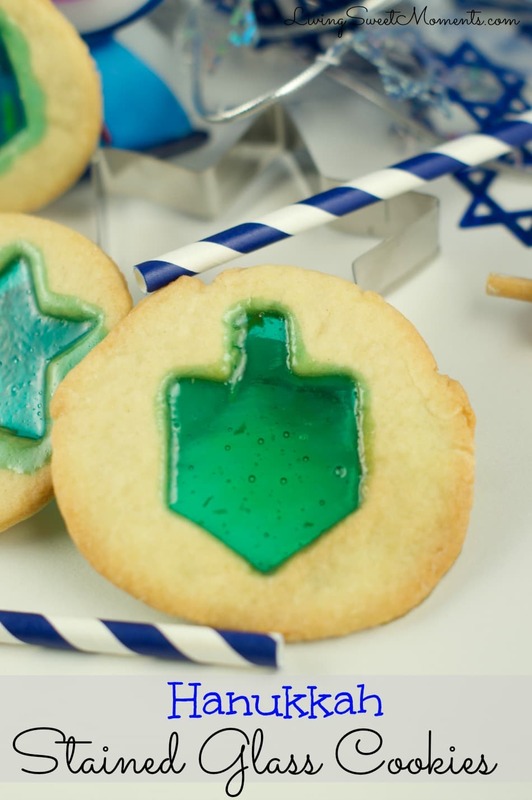 If you don’t celebrate Hanukkah you can cut out other shapes with cookie cutters or a paring knife. The possibilities are endless! You can make them square and cut out little hearts or Christmas ornaments with red stained glass. 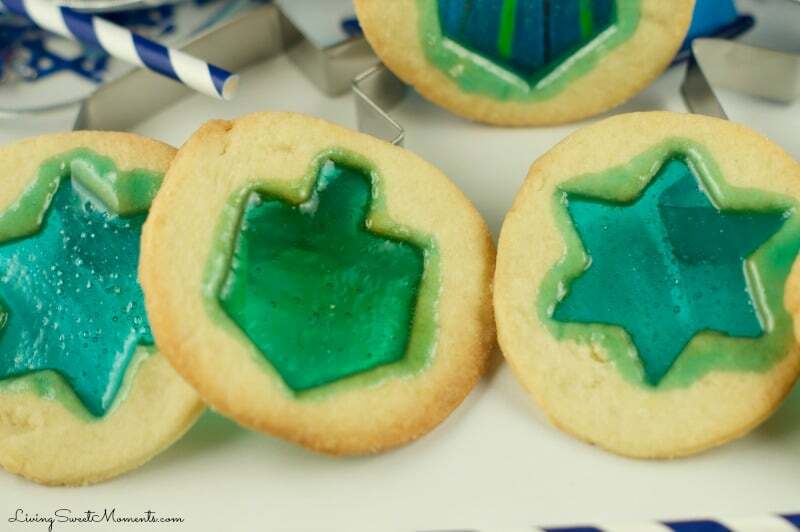 Believe it or not, these are VERY easy to make and even novice bakers will have success with these Hanukkah Stained Glass Cookies. Your kids can help you roll, shape and decorate them. It’s a fun activity for a lazy Sunday morning. For these cookies, I used my trusty old cookie dough recipe. 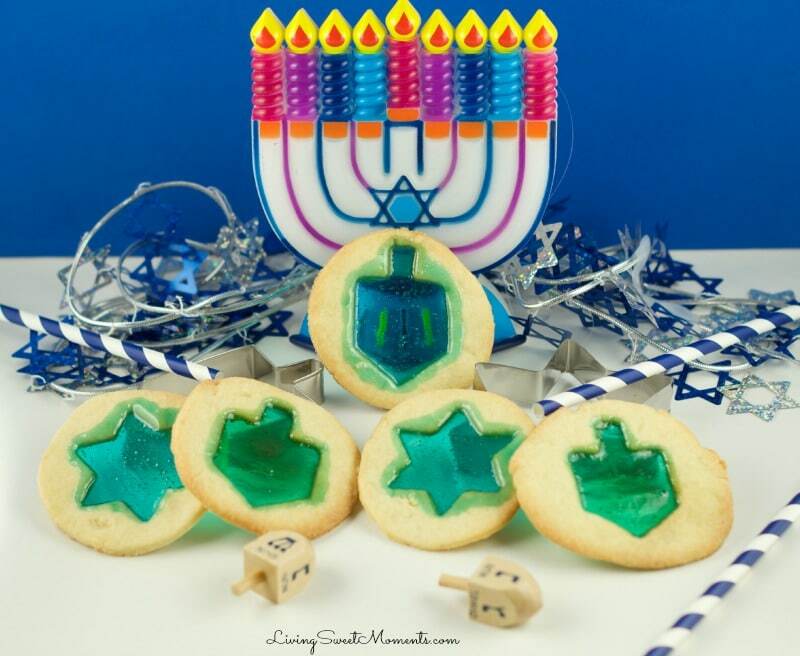 The same one for the Hanukkah Jelly Cookies and Guava Rugelach Cookies. 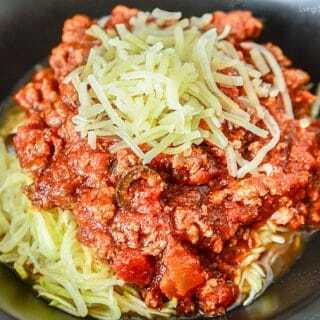 It’s soft, crumbly, sweet and full of flavor. Plus it freezable and since I always make a few batches a time, there’s always cookie dough in my freezer ready to be rolled, filled and baked. 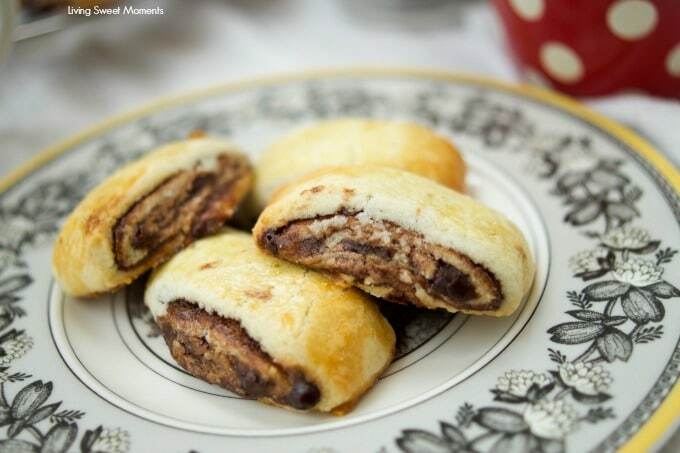 To make these cookies, simply make the dough (recipe below). Refrigerate for 30 minutes, roll and cut out circles using a cookie cutter or a rimmed glass. Place the cookie circles in a jelly roll pan and cut out little shapes using a small cookie cutter. In the center add a piece of hard candy and bake. The hard candy melts inside the oven creating the stained glass effect. Hope you can try these at home! This is easy. Thanks for sharing. I’ll attempt this next weekend! 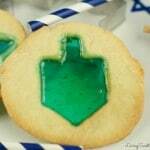 I have never had a hanukkah cookie. But they look good. I’d like to try one. I tried them this weekend and they stuck to the pan. I then cooked them on parchment and gently peeled them off — it was better. The dough recipe was really good. Oh I am glad they came out great with parchment paper Jen! I am so glad you liked the recipe.. 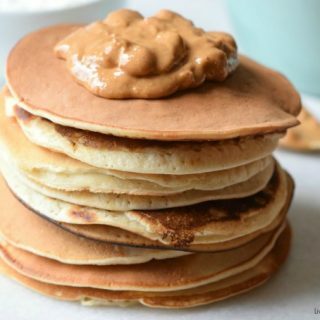 I can imagine they stuck without using parchment paper or a silpad.. the melted caramel can be very sticky. 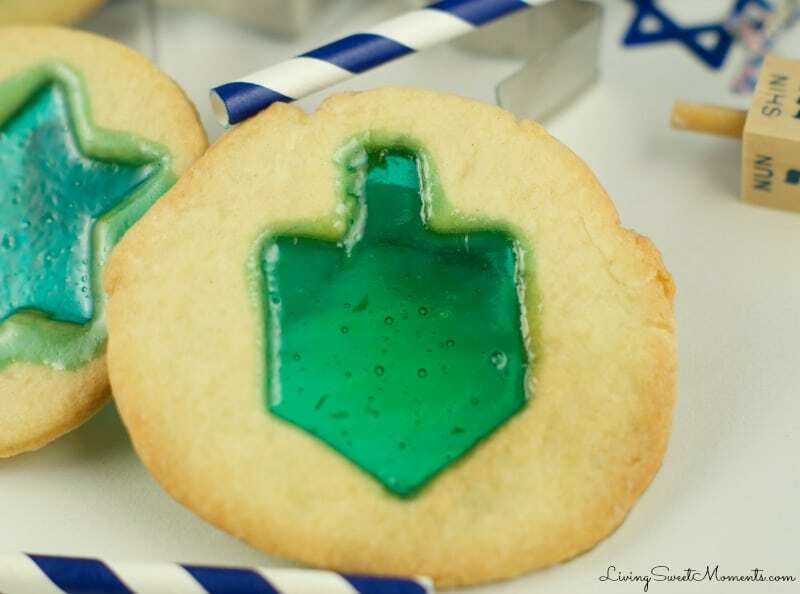 I love the stained glass cookies. They turned out beautifully. but it is much too early for Hanukkah gifts. Have you ever tried freezing them? Will the candy cloud up or break? Hi Janice! The dough is definitely freezable. The cookies can be baked a week in advance. Freezing them baked would alter their texture. Chag Sameach! I made these cookies for a Channukah party last night. They came out just like the picture but they did not taste good. 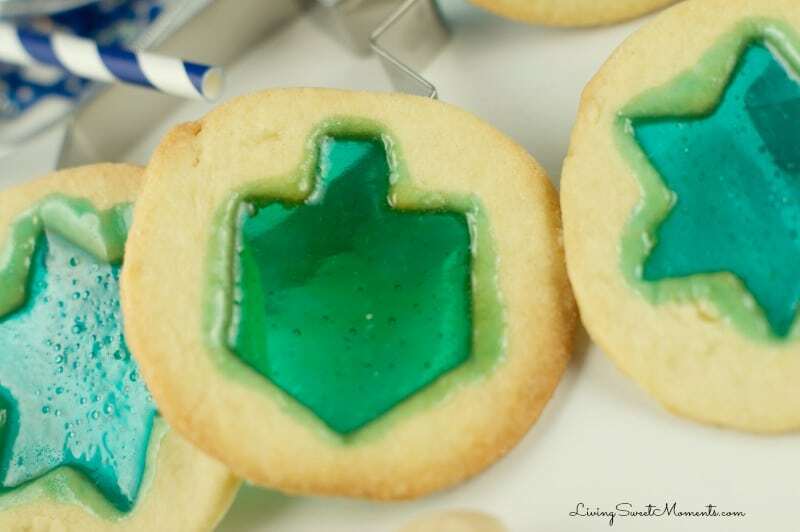 Very bland – thanks for the idea of the stained glass effect, but next time I’ll use a different recipe for the sugar cookie. Hi Michelle! Thanks for your honest review. 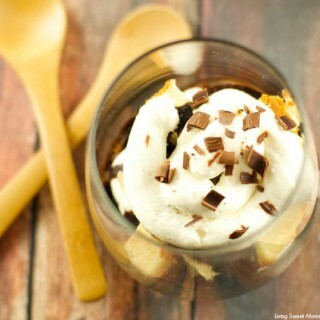 Maybe next time add a few drops more of Vanilla extract or any other extract (to suit your taste). 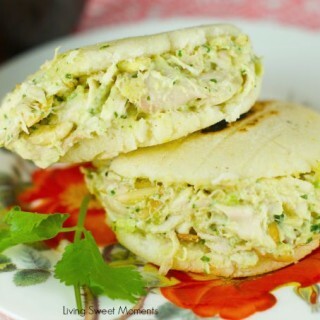 Citrus zest and spices go really well with this recipe too.